David Hogg has a blog post about measuring the speed of light with Kepler. This is actually closely related to an idea I’ve wanted to blog about for a while now. As the Earth orbits the Sun, the stars seem to change position. The analogy often used to explain this is that you imagine you are in the back of a moving pick-up truck, and you want to catch rain (which is falling straight down with no wind) in a deep bucket. You should not hold the bucket vertically, because you are moving laterally and rain will hit the side of the bucket. For optimal rain catching you should tip the bucket in your direction of motion by an angle equal to the arctangent of your velocity divided by the speed the rain is falling. By “leading” the rain like this you will get maximum rain in the bucket, because no rain will hit the sides of the bucket: it will all fall straight to the bottom. Likewise, as telescopes collect light from stars overhead, we have to “lead” the photons by an angle equal to the arctangent of the Earth’s velocity through space divided by the speed of light. If one could measure this effect, one would be measuring the speed of the Earth around the Sun in units of the speed of light. Equivalently, one would prove that the Earth orbits the Sun, and even measure its speed. Now, this is actually hard. Radio telescopes point this well, so handle this effect, but most optical telescopes don’t worry about it too much because you just get close to your desired coordinates and then find your object (or nearby objects) to correct for the inevitable pointing errors. To really do this right, you would need to know about an absolute position on the sky, and then measure the motion of stars with respect to that position as a function of time of year. Over the year, they should seem to move by 30 arcseconds (1/120 of 1 degree — that’s a lot to an astronomer) in an ellipse with respect to that point. The problem is the absolute pointing — how can you find a spot on the sky to that precision over the course of a year? Also, stars move through the night, so you’ll have to very carefully observe at the same sidereal time every night, which is tricky. Also, differential refraction in the atmosphere is a function of time and wavelength… the whole problem is hard. There is one spot on the sky where this works. The North Celestial Pole — the point in the sky directly above the Earth’s rotational axis. By exposing a camera for a long time (hours) while pointing at this part of the sky, one can find the North Celestial Pole because the stars will form star trails around that point. 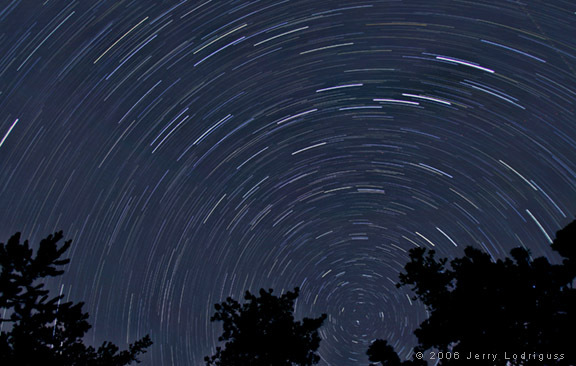 As the year progresses, the center of these trails will seem to change — really the apparent positions of the stars are moving because of aberration as the Earth goes around the sun. Finding the coordinates of the apparent NCP in an image of star trails is not standard image analysis — you’ll need some sort of custom Hough transform or something. The precession of the equinoxes ALSO causes the NCP to appear to move (in this case it really is the NCP that’s moving, not the images of the stars!) You’ll have to track things for multiple years to disentangle the aberration (an annual ellipse) from the precession (a secular, almost linear trend). This problem is analogous to disentangling proper motion and parallax for images of stars. So, it’s a multi-year project to demonstrate an effect that everyone knows exists. But if you do it, you’ve measured the velocity of the Earth’s orbit around the sun and proven that Copernicus was right! This entry was posted in science, Uncategorized and tagged science on October 13, 2013 by jtw13.